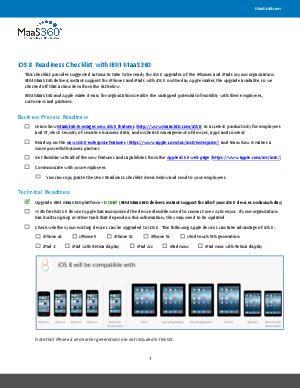 This checklist provides suggested actions to take to be ready for iOS 8 upgrades of the iPhones and iPads in your organization. IBM MaaS360 delivers instant support for iPhones and iPads with iOS 8 on the day Apple makes the upgrade available, so we checked off that action item from the list below. IBM MaaS360 and Apple make it easy for organizations realize the untapped potential of mobility with their employees, customers and partners.